It's Not Work, It's Gardening! : Table for four? 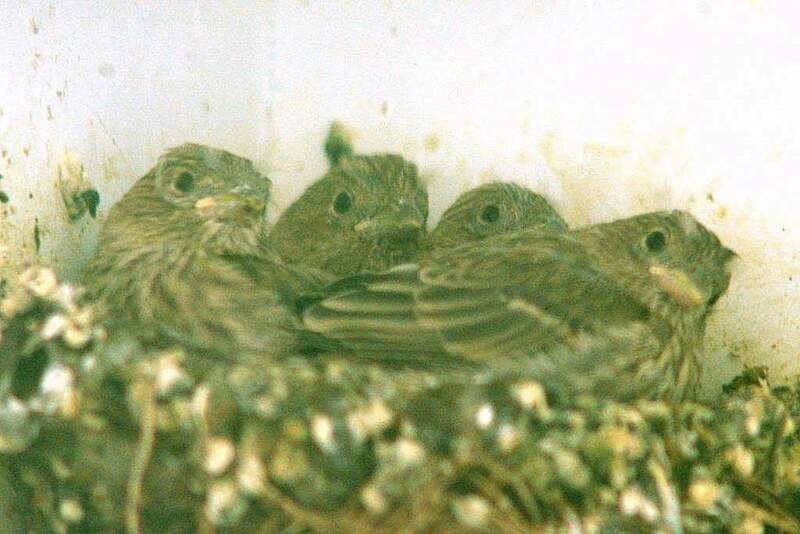 Finch chicks. Table for four? 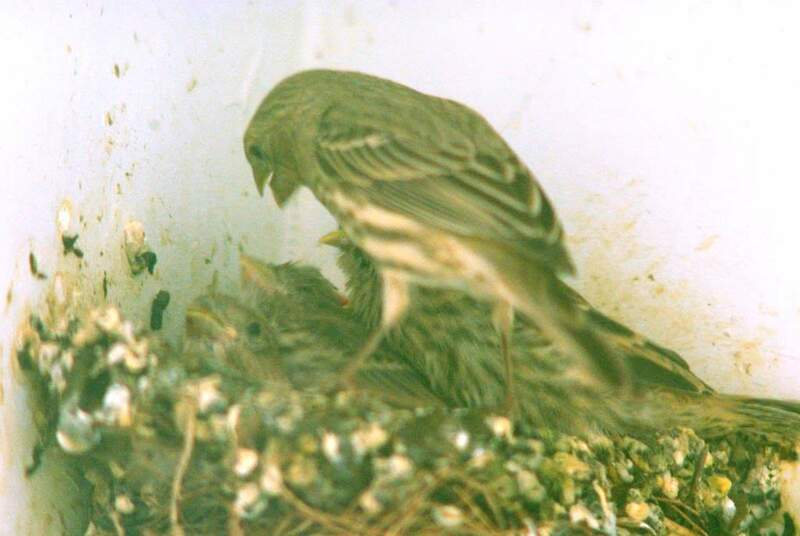 Finch chicks. 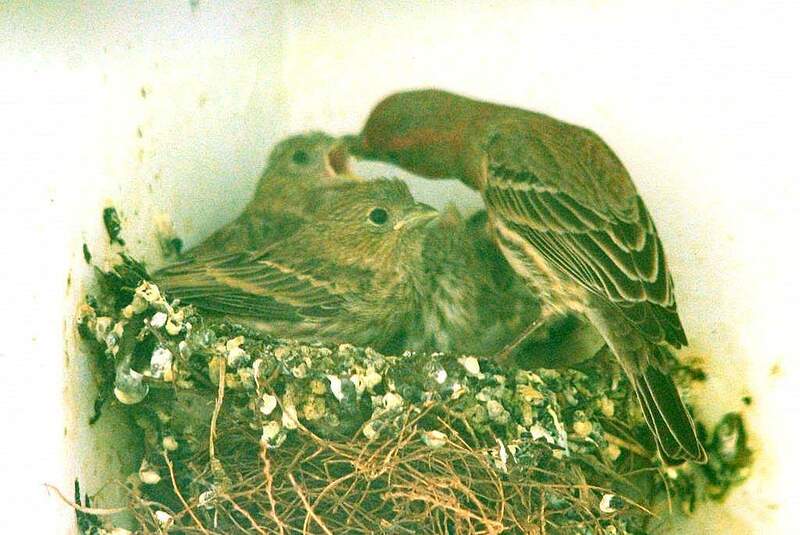 A while back I mentioned the nest that the house finches were building under my porch roof, but I haven't talked about it again since then. 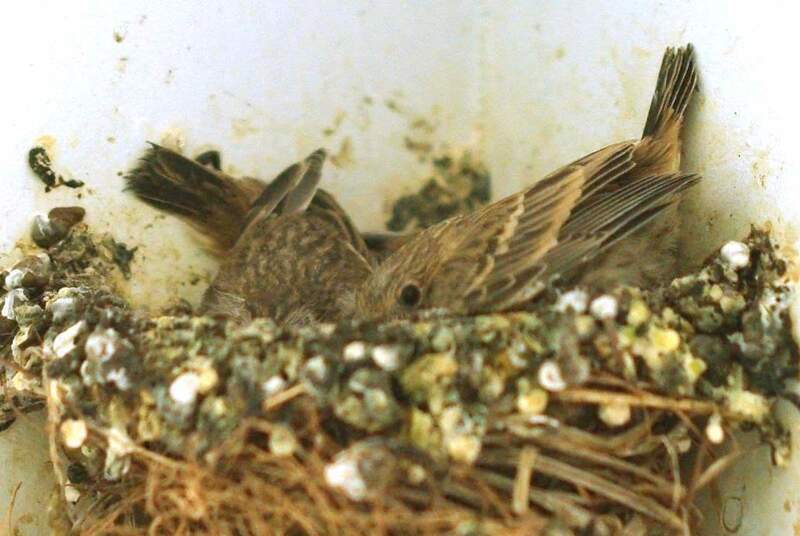 I always forget how quickly baby birds grow up, and if you don't watch almost every day you're going to miss something. Well I finally took some time to watch, and good thing I did it now, because these guys are just about ready to leave! 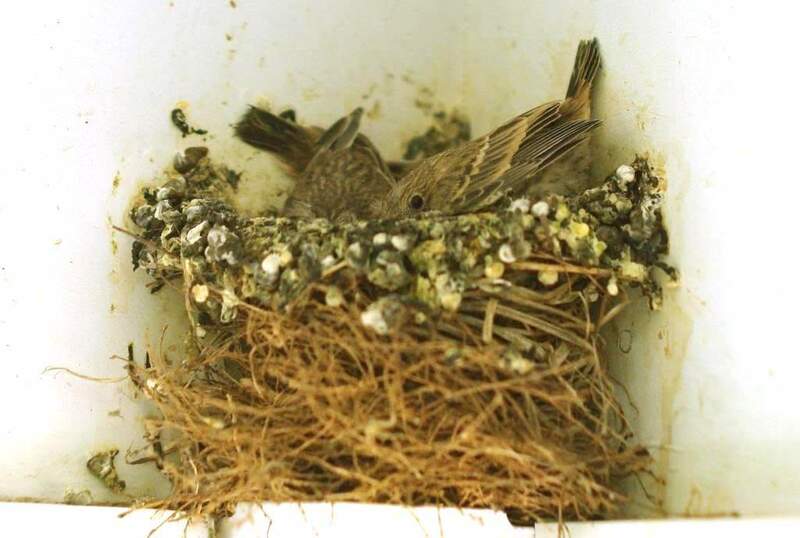 I'm still not certain why the nest was built so tall, except that there were five chicks in here at one time, and maybe the extra height gave more room? 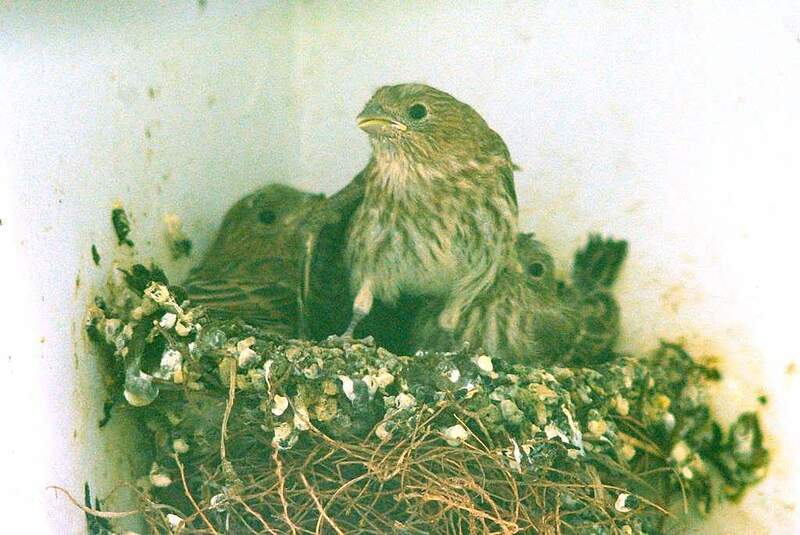 I'm hoping the fifth baby fledged already and didn't die when young. Incidentally, most of the photos except the one above this line and the two below were taken from inside the house. 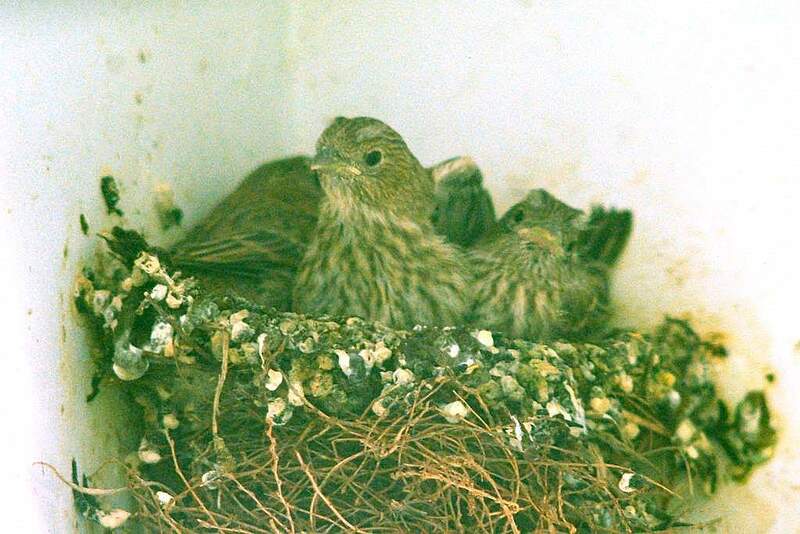 Getting up on the ladder with the camera was scary for the chicks -- it was the first time they'd ever seen anything other than their parents up at nest level. Is the big-eye monster gone yet? 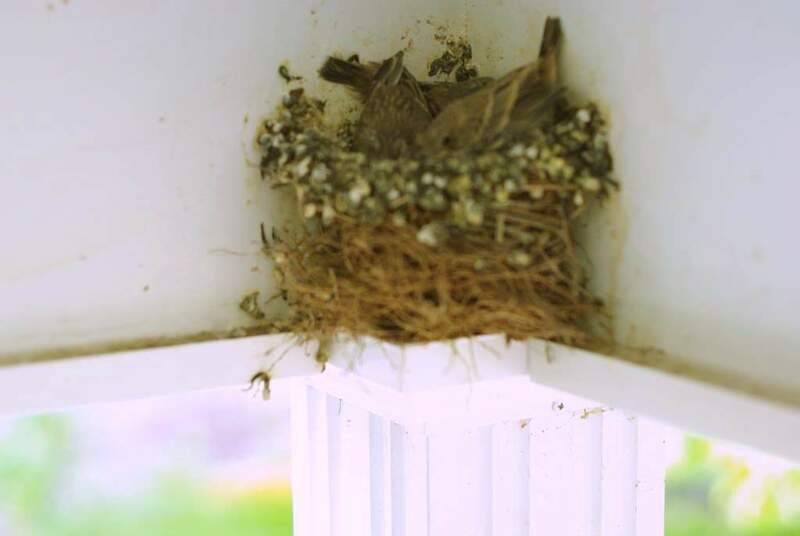 The nest is located at the top of the post that supports my small porch overhang, so these guys have never seen anything except my small porch. They don't realize that a huge world is just around the corner! "Will you guys stop wiggling around?!" "I need more space! I think I'm old enough for my own room now..."
"What is this, vegetables? You know I hate vegetables!" "Dad, can I have some more vegetables please?" "A little privacy please, and no peeking!" "I am so hungry... this looks like something yummy..."
"I've told you again and again DO NOT EAT WALL STICKINGS!!" "Mom, mmrf, Mom, chmff -- Wait! I'm still hungry!" then a little more waiting and eating. I should point out that feeding takes maybe 10 or 15 seconds, while the waits between feedings can be five minutes or longer. Sometimes much longer, or at least it feels like it while holding a camera in a weird crouch position to get the right angle for the shot. 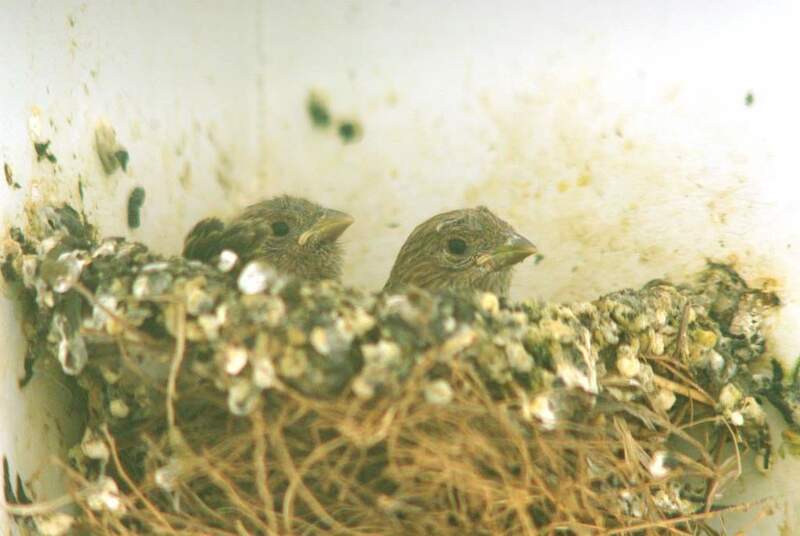 As you can tell from these photos, these chicks are very close to leaving the nest. In fact, after watching for a little while longer I saw a couple of the chicks fly out, then fly back again. "Um, guys? Where did you go guys?" 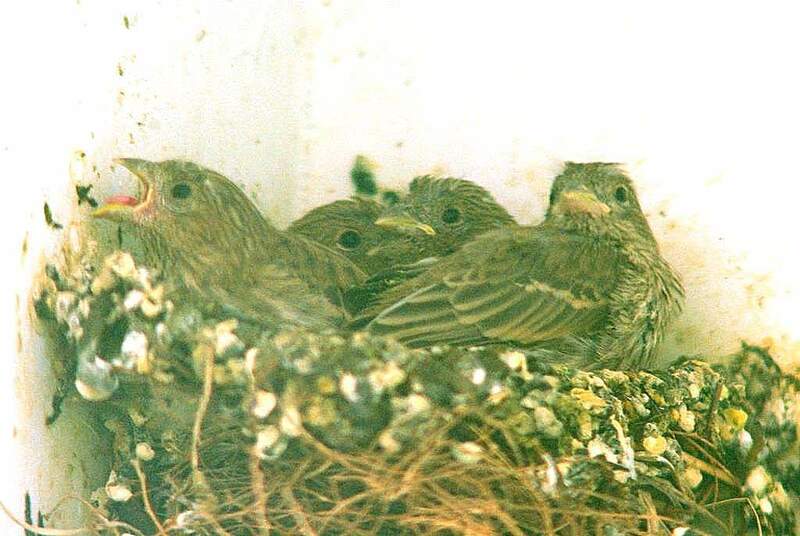 Do the remaining chicks appreciate having some extra room now, or is it strange, compelling them to also test their wings and see what's outside the porch? 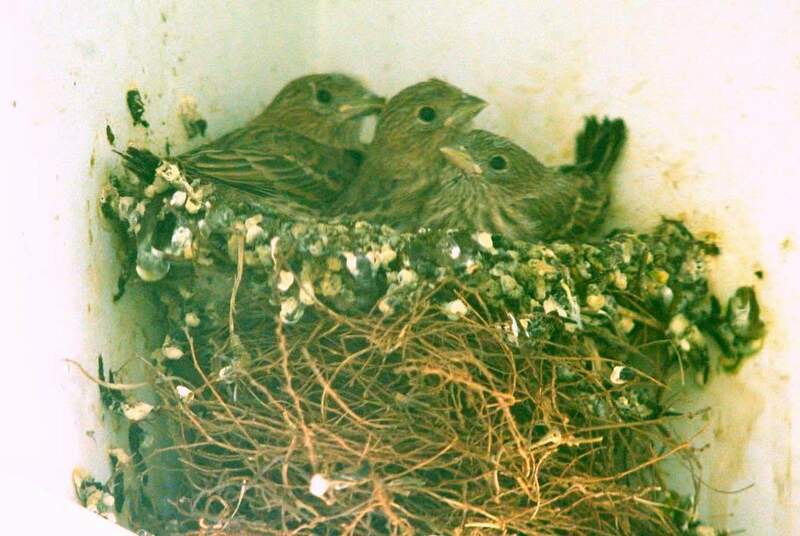 If this year's pattern follows last year's, a second brood will be started in another week or so. Maybe I'll be able to stay on top of that one and get a wider variety of photos. 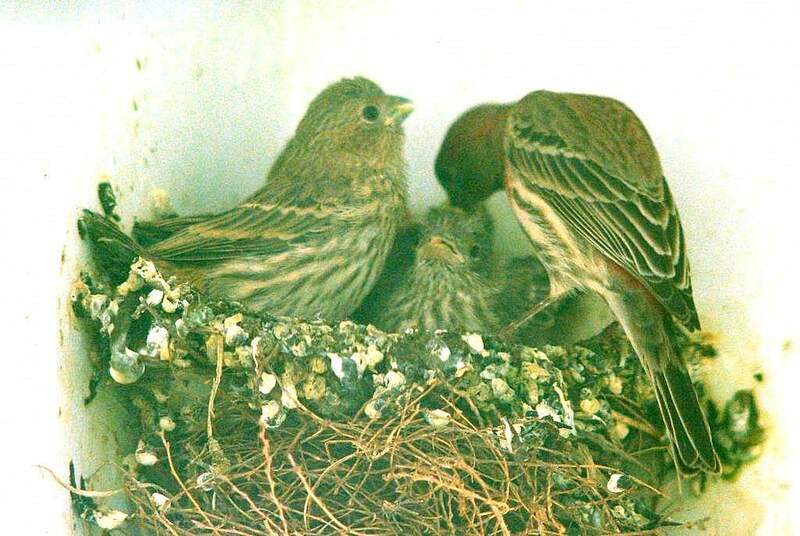 Even if I don't, I appreciate being able to get this close look at the nesting habits of house finches. 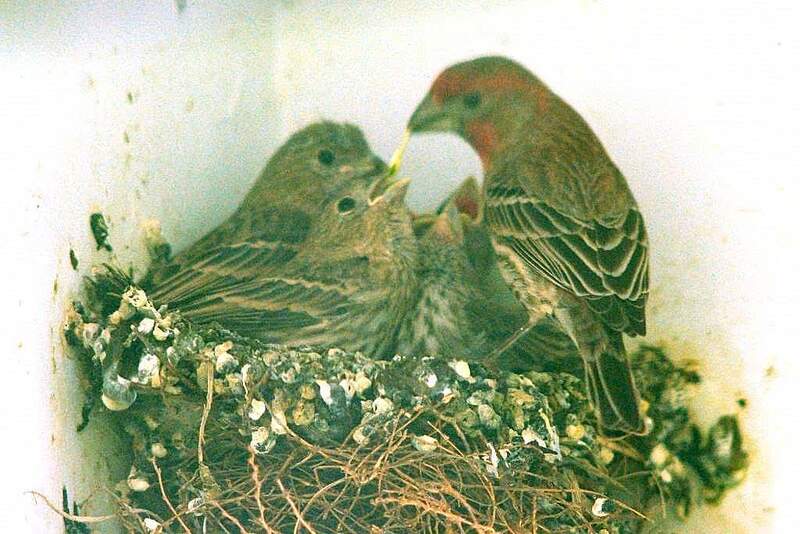 Click here for a look at last year's finch posts. An AMAZING Photo Post!! Stunning photos, thanks so much for sharing these with us! 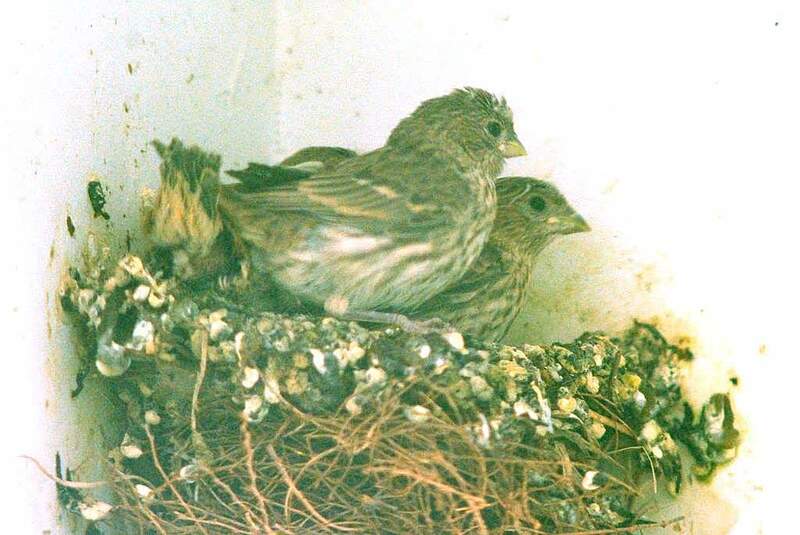 We have house sparrows that make a nest in the same spot like that every year - in the corner of the porch at the top of the post. It really is fascinating to watch. We are always so anxious on 'learning how to fly' day. I think we're as worried as they and their parents! 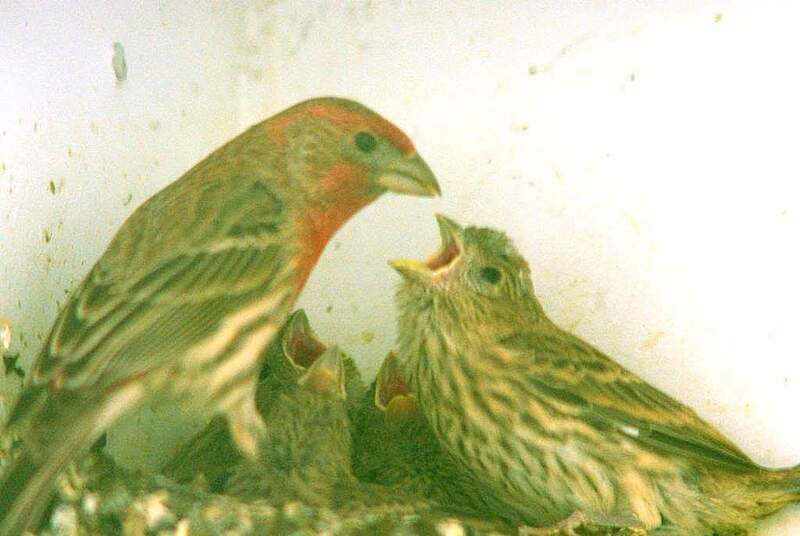 Have fun watching your finches. Great pics! So familiar! 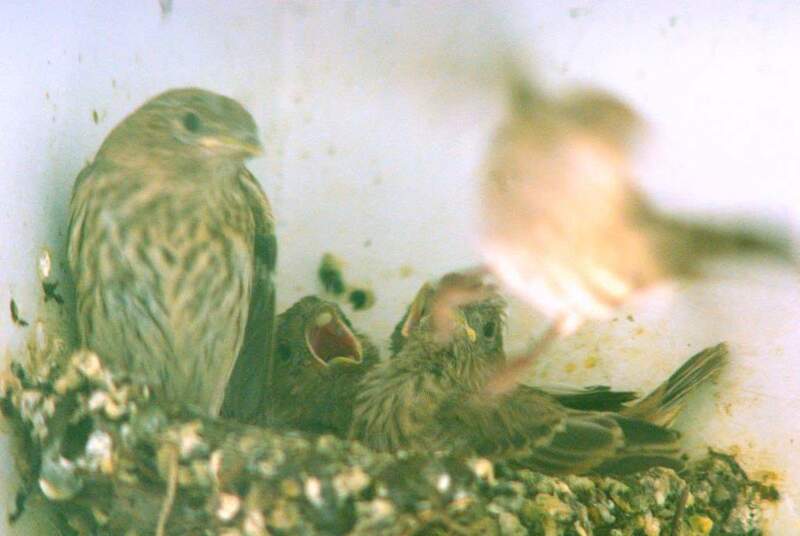 The first round of babies here has already been evicted. Still waiting for the hummingbird egg to hatch. What a brave bird - I've been close enough to touch the hovering little thing. You must have an exciting time taking shots of that hungry family. They eat all the time. I wonder how the parents manage. It must be really tiring. I took care of a baby before and fed it every half hourly. Imagine having 5 hungry babies!!! Very cute. I think no vegetables though just insects.